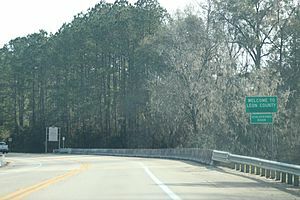 Leon County is a county located in the U.S. state of Florida. As of the 2010 census, the population was 275,487. The county seat is Tallahassee, which also serves as the state capital. The county is named after the Spanish explorer Juan Ponce de León. Leon County is included in the Tallahassee, FL Metropolitan Statistical Area. Tallahassee is home to two of Florida's major public universities, Florida State University and Florida A&M University. Leon County residents have the highest average level of education among Florida's 67 counties. Originally part of Escambia and later Gadsden County, Leon County was created in 1824. It was named after Juan Ponce de León, the Spanish explorer who was the first European to reach Florida. During the 1850s and 1860s, Leon County was a "cotton kingdom" and ranked fifth of all Florida and Georgia counties in the production of cotton from the 20 major plantations. Unique among Confederate capitals east of the Mississippi River in the American Civil War, Tallahassee was never captured by Union forces, and no Union soldiers set foot in Leon County until Reconstruction. Also see Plantations of Leon County. According to the U.S. Census Bureau, the county has a total area of 702 square miles (1,820 km2), of which 667 square miles (1,730 km2) are land and 35 square miles (91 km2) (5.0%) are water. Unlike much of Florida, most of Leon County has rolling hills, part of north Florida's Red Hills Region. The highest point is 280 feet (85 m), located in the northern part of the county. Leon County sits atop basement rock composed of basalts of the Triassic and Jurassic from ~251—145 million years ago interlayered with Mesozoic sedimentary rocks. The layers above the basement are carbonate rock created from dying foraminifera, bryozoa, mollusks, and corals from as early as the Paleocene, a period of ~66—55.8 Ma. During the Eocene (~55.8—33.9 Ma) and Oligocene (~33.9—23 Ma), the Appalachian Mountains began to uplift and the erosion rate increased enough to fill the Gulf Trough with quartz sands, silts, and clays via rivers and streams. The first sedimentation layer in Leon County is the Oligocene Suwannee Limestone in the southeastern part of the county as stated by the United States Geological Survey and Florida Geological Survey. 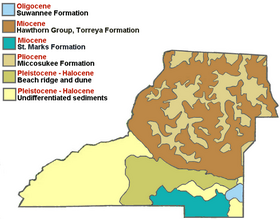 The Pliocene (~5.332—2.588 Ma) is represented by the Miccosukee Formation scattered within the Torreya Formation. Sediments were laid down from the Pleistocene epoch (~2.588 million—12 000 years ago) through Holocene epoch (~12,000—present) and are designated Beach ridge and trail and undifferentiated sediments. In the county, the population was spread out with 20.0% under the age of 18, 26.3% from 18 to 24, 22.7% from 25 to 44, 22.4% from 45 to 64, and 8.7% who were 65 years of age or older. The median age was 27.8 years. For every 100 females there were 91.57 males. For every 100 females age 18 and over, there were 89.03 males. 2007 National Association of County Park and Recreation Officials' Environmental and Conservation Award for exceptional effort to reclaim, restore, preserve, acquire or develop unique and natural areas. Leon County has 1,300 acres (5.3 km2) of open space, forest and woodlands between the Miccosukee Canopy Road Greenway and J.R. Alford Greenway. Three sites within Leon County have yielded fossil remnants of the Miocene epoch. The article Leon County, Florida paleontological sites includes the Griscom Plantation Site, Seaboard Air Line Railroad Site, and Tallahassee Waterworks Site with fossils by genus and species. Leon County (Florida) courthouse in Tallahassee; 2007. Leon County, Florida Facts for Kids. Kiddle Encyclopedia.